I ran across SpaceCraft MFG, a manufacturer of non fiberglass trailers & tractors that includes a 57', 6 slide 5th wheel designed to be pulled by a semi tractor. Take a look to see what the other end of scale looks like! Well Jon, where else do you go from the 21 and Tacoma? Merry Christmas, is Sweet Darlene serving Christmas Dinner? Lol too funny. Bit too much for me. Stay with my 5 TA. Can you imagine towing that puppy? No thx! Ahhhhhh - that is crazy! any ballpark ideas on price? just curious. I thought there was a maximum semi trailer length limit of 53'. Just convert the back end of this and no need to drive at all. While these things are huge (check to their Hauler) here is my favorite towing photo. 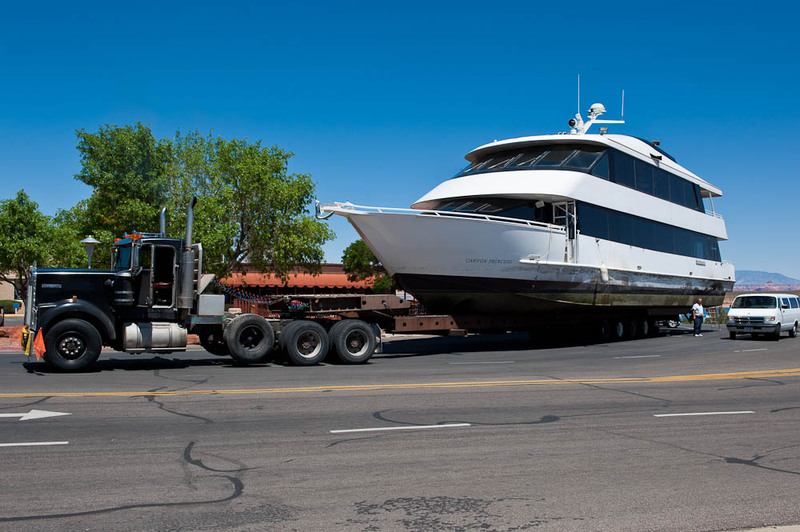 This boat is kept on Lake Powell. It must have been interesting getting it there.